A petition is gaining strength in Elmswell over plans to build 250 new homes in School Road. More than 70 comments have already been received by Mid Suffolk District Council over the outline plans which include concerns over traffic and the strain on schooling and the doctor’s surgery. Now residents are being asked to add weight to a petition being organised in the village and can be signed at the Mace shop and Station Pharmacy, on Station Road, or at the Co-op, also in Station Road, on Saturday and Sunday. Many residents have already outlined their objections to the council and Elmswell Parish Council is also against the scheme saying it would be unsustainable in terms of highways infrastructure and education provision, it would seriously impair the most important landscape aspect in the village, would be to the serious detriment of the historic listed built environment and would effectively sterilise the opportunity for the community to work towards the aspiration of a relief road taking traffic over the railway line and directly to A14. Hello and welcome to what will become a very busy area of an already busy and informative web site. 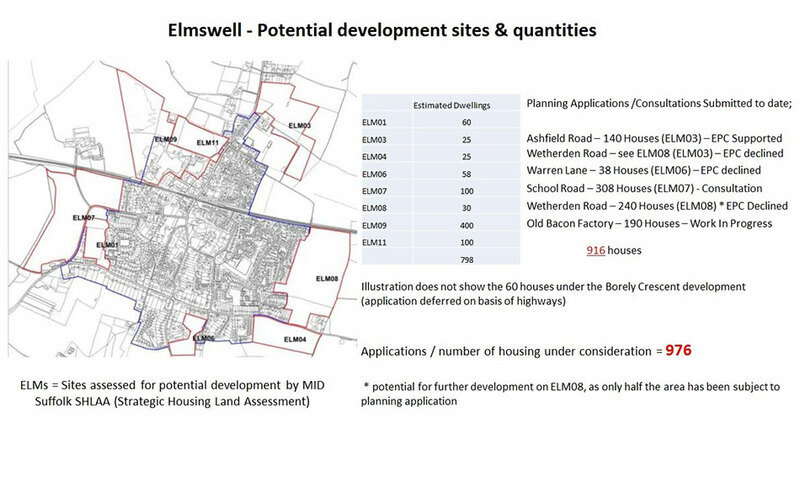 We hope to hold a positive dialogue with all interested parties in regards to what we see as extensive housing developments in and around the village of Elmswell, and therefore adversely affecting / over burdening the infrastructure that supports our fantastic village. Advise all that could not attend the public meeting of what is potentially happening on your doorstep. Is there an item of planning law / conditions that has been overlooked? Are you willing to get involved with holding positive correspondence with the decision makers? 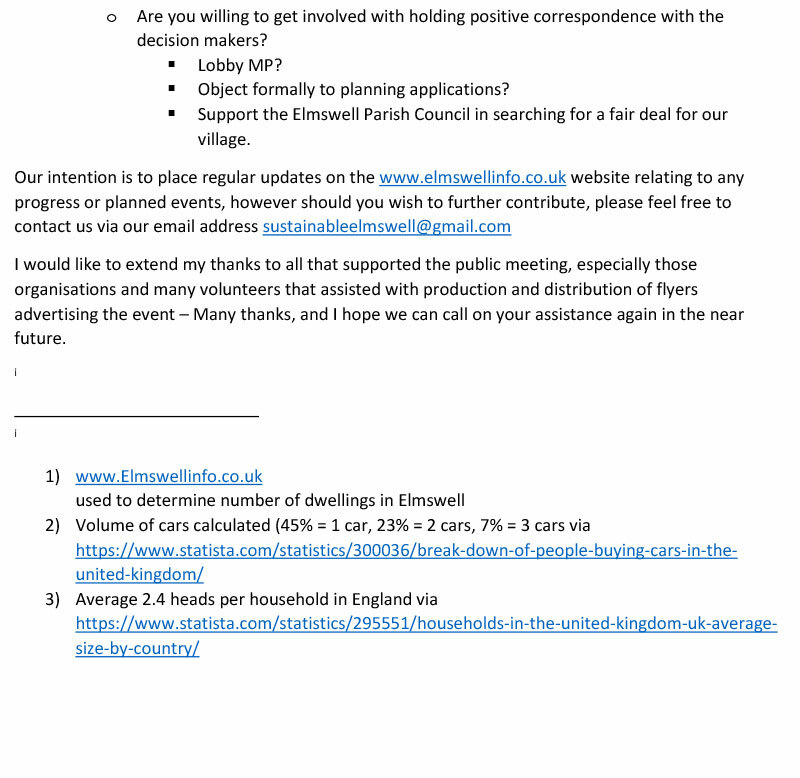 Support the Elmswell Parish Council in searching for a fair deal for our village. To reach out to people from other nearby villages to facilitate sharing of information and support. Our intention is to place regular updates on this website relating to any progress or planned events, however should you wish to further contribute, please feel free to contact us via our email address sustainableelmswell@gmail.com or please feel free to also join our Facebook page entitled https://www.facebook.com/groups/1764260857223527/. Object formally to planning applications. Wednesday's Parish Annual Review saw a generalised discussion surrounding planning applications and the legal requirements that Mid Suffolk District Council are obliged to adhere to whilst balancing the needs of the county in terms of sustainable growth of its district. Growth was clarified as multi-faceted and not just in terms of building houses. There were numerous questions from the residents, looking for reassurance around the extent of the potential development of the village, along with gaining clarification as to legal aspects of the planning applications, these questions were responded to by Tom Barker who answered all questions openly and offered a full explanation of the processes involved. During the meeting, it was clear that the residents have no faith in the planning application process, as is was clear that resident’s views / opinions have no real legal recourse when compared to the statements made by Transport, Health departments. It was clear that the shortage of sustainable housing along with government targets to facilitate growth along the A14 corridor will have a significant affect upon any planning decisions made. 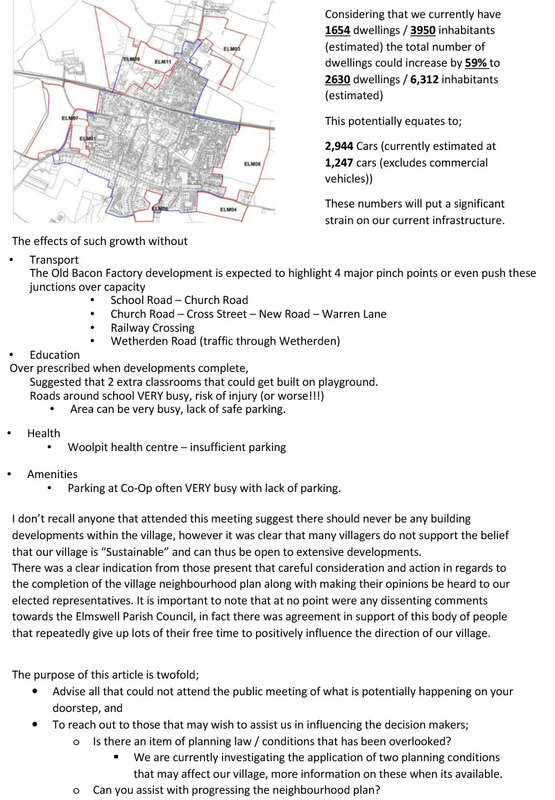 Elmswell resident Rob Duckett stressed the point that proportionality size of developments should be considered when taking an overview of all potential developments within a local area, of which was met with agreement. 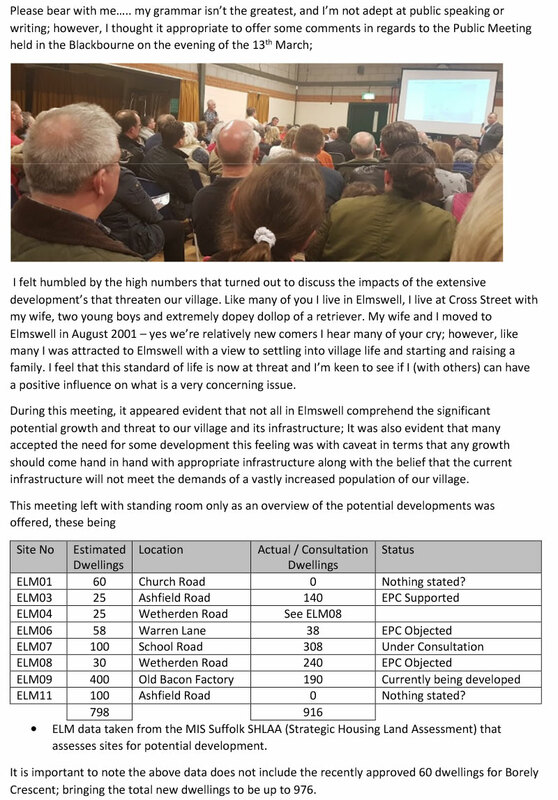 Elmswell residents are currently compiling their own traffic census along with preparing factual arguments in preparation of the MSDC planning application meetings due in June. Please feel free to contact Rob Duckett or Paul (Peachey) if you are able contribute to the census.